While creating the perfect smile line may not be your forte, there are many tips and techniques that can help you master this sometimes frustrating process. Whether you are doing a painted French manicure, a sculptured set of pink and white acrylics, or an overlay with white tips, there are some tried and true methods to make that smile line a little bit easier. So read on to see how some of the experts do it. And hey, while you’re at it, stop worrying — this is just one of those things that comes with practice. “Galaxy’s White Lightning tips (far right) are designed so that the nail professional can cus­tomize the smile line according to each client’s needs. This can be done by simply filing the smile line either dramatically deep (center) or with a moderate arch (left). Since the color density is consistent throughout the entire tip, there is never any shadowing at the smile line; and nail professionals can save time because the tip does not require any blending,” says Lee. “One thing I do, especially in competition, is carve underneath the smile line at an angle. This way, when I fill in the pink, it hits the white and creates an angle, which in turn creates a shadow for sharp definition. When you do this, the white really pops,” says Holcomb. “It is very hard for a novice just starting out to create smile lines that are nice and dean. The tendency is to want to take the brush and back-brush the smile line to clean it up. But when you do that, you are overexposing your client to the product by getting monomer on their soft tissue or natural nail. Instead, you can take a smaller brush (I prefer Creative’s Crystal Touch Honey Oval Brush.) and dip it in Creative’s ScrubFresh and clean up the smile line before the product sets. Remember, if you do this, you will only want to use that brush with ScrubFresh from now on,” says Etters. “To clean my smile line up, I dip the brush in monomer and roll it to a point on a paper towel. This helps to get rid of all the excess liquid. Then, using the point, I gently do the corners and smooth out the line,” says Nguyen. Freehand French “I start off by setting the brush on the left side of the nail, pressing it until it fans out, then dragging the brush toward the center. I do the same thing from the right side, until they meet in the center. Next, I stroke the polish down, filling in the free edge. I eyeball it. If my hand shakes or the client moves, making the smile line uneven, I will take a paint brush dipped in polish remover; and I will clean up the line that way.” Michele Baker, Euro Stylecutters, Land O’Lakes, FL“When I do a French with polish, I have found it easiest to do it freehand. Sometimes I will use a nail art striper brush to make a really crisp line. The thin brush is easier to use and the paint usually dries faster than polish,”says Eric. 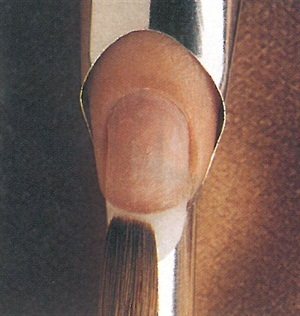 French manicure tip guides are another option when painting. Apply base coat to each nail. Once the base coat has dried completely, peel the guide from the sheet, placing it just below the white tip area so that the free edge is separated from the rest of the nail plate. Apply the white nail tip colour to the free edge. Allow the polish to dry and then carefully remove the guides. Follow with a sheer nail bed colour of your choice (many are available from various manufacturers) over the entire nail and finish with a clear top coat. 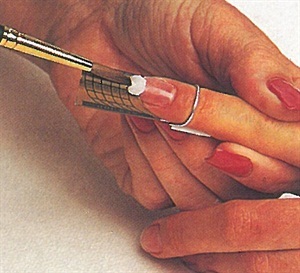 Some companies sell kits designed especially for the French manicure. The kits usually include a base/top coat, a nail tip polish and a nail bed polish, and guides like the ones described above. They come in a variety of color combinations. Shown here are examples from Orly and American Manicure. 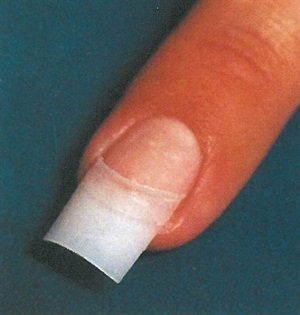 Some French manicure decals are applied using water. After applying an even coat of polish to the nail bed and letting it dry, take the cut-out design, apply a few drops of water to it, and wait for 30 seconds until the water penetrates the backing. 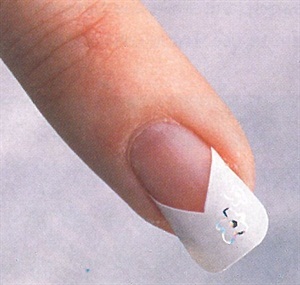 Carefully slide the design off the backing and position it on the client’s nail. After pressing gently, apply an even layer of top coat over the entire nail — be careful not to brush too hard or you may rip the design. After the top coat has dried completely, carefully remove any loose decal material at the free edge with your fingers. 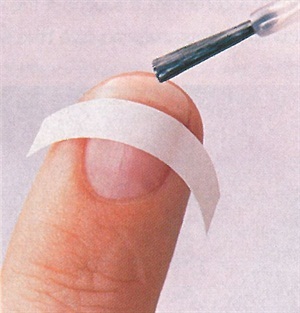 Using self-adhesive decals, make sure that you are working with dry, clean nails. Select the desired size of decals (the one shown is from Cina Nail Creations) and using tweezers, peel it from the sheet, Position the decal on the free edge of the client’s nail. Beginning at the center; smooth the entire decal toward the sides and the free edge. 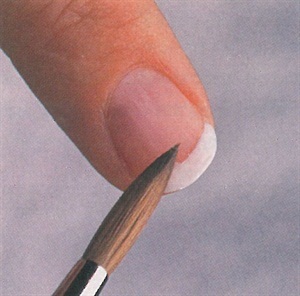 Trim any excess around the edge of the nail with small scissors. Apply top coat and allow to dry.